I received my new cauldron today. Finally, my laboratory is complete! For days, I have been gathering and drying ingredients in anticipation. What shall I mix first? I have a strong hunch about raven's feather and mandrake root. And they say you can never go wrong with a toad. But then, what do they know? This is my laboratory, my research! Once I have published my theories, the others will be coming to me! I am determined to prove that I have the greatest mind that ever studied alchemy. So now, I shall light my fire, for it is time to get to work. Knowledge, wealth, and fame can all be found in the murky depths of the cauldron. 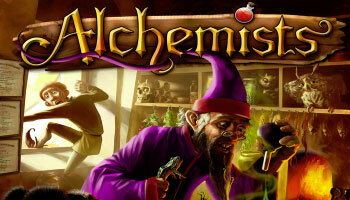 In Alchemists, two to four budding alchemists compete to discover the secrets of their mystical art. Points can be earned in various ways, but most points are earned by publishing theories - correct theories, that is - and therein lies the problem. 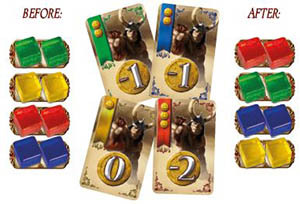 Players declare all their actions by placing cubes on the various action spaces, then each action space is evaluated in order. Players gain knowledge by mixing ingredients and testing the results using a smartphone app (iOS, Android, and also Windows) that randomizes the rules of alchemy for each new game. And if the alchemists are longing for something even more special, they can always buy magical artifacts to get an extra push. There are 9 of them (different for each game) and they are not only very powerful, but also very expensive. But money means nothing, when there's academic pride at stake! And the possession of these artifacts will definitely earn you some reputation too. Players can also earn money by selling potions of questionable quality to adventurers, but money is just a means to an end. The alchemists don't want riches, after all. They want respect, and respect usually comes from publishing theories. Flavor text: Mandrake root and scorpion tail; spongy mushroom and warty toad - these are the foundations of the alchemist's livelihood, science, and art. 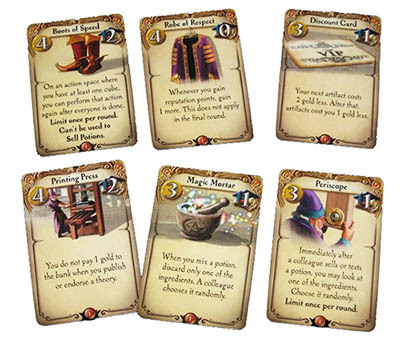 Two to four players take the role of alchemists competing to discover the secrets of their mystical art. Points can be earned in various ways, but most points are earned by publishing theories - correct theories. Therein lies the problem. 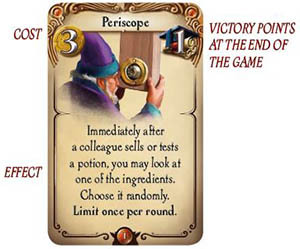 Players gain knowledge by mixing ingredients and testing the results using a card-scanning app on a tablet or smartphone. They deduce how to make potions that they can sell to adventurers. To find the ingredient you want, sometimes you have to spend a little extra time in the forest. Be sure to bring a stout walking stick to ward off wolves, bears, and rival alchemists. For example, if you correctly predict the result of mixing toad and scorpion and then correctly predict the result of mixing toad and fern, you get 3 points because you used 3 different ingredients.